Dreamt up in the UK in the 1990s, Public-Private Partnerships (PPPs) have over the last two decades spread across public services in this country, and now increasingly around the world. As a way of paying for public infrastructure and services like hospitals, power stations or transport, their chief attraction to governments is that the cost of borrowing does not appear on the national balance sheet, meaning it doesn’t appear to increase the government’s debt. Yet as an increasing body of evidence shows, this ‘buy now, pay later’ model has more often than not led to more expensive, less democratically accountable, and lower quality public services than those directly funded by governments. What’s more, the complicated legal and financial structures behind PPPs obscure a simple fact: they leave an enormous legacy of hidden public debts. The UK has been the trailblazer for PPPs through the Private Finance Initiative, described by academics as a ‘huge financial disaster’ for our economy. Yet despite this, the UK government is today pushing developing countries towards this global debt iceberg. The term PPP is usually used to refer to a long-term contractual arrangement between a government or other public body and a private company or companies in relation to the supply of public infrastructure or services. The core principle of the socalled ‘partnership’ is that the private companies take on the up-front costs of the project in return for guarantees from the government that they will make a profit on their investment over the lifetime of the contract. Public-Private Partnerships are increasingly being promoted as the best way for governments around the world to invest in public infrastructure and services like energy, transport, telecoms, water, health and education. The amount of money invested in PPPs in the global South exploded in the late 2000s, rising from $22.7 billion in 2004 to $134.2 billion in 2012. This is not happening by accident –globally the PPPs agenda is already very advanced and there is a big push behind the expansion of the PPP model. There is consensus amongst the IMF, World Bank and G20 about the desirability and need for this type of funding model, and rich countries and the institutions they control are strongly pushing PPPs through aid and the conditions attached to grants, loans and debt relief. The main justification being put forward runs as follows: 1. Governments have insufficient funds to deliver public services and infrastructure, whereas globally there is trillions of dollars of private finance searching for a return on investment. 2. Governments can ‘leverage’ this private finance into public services and infrastructure by providing public guarantees to private companies to build, maintain and deliver them. From the private sector’s perspective, during a period of global economic slow-down, the large amount of money that governments spend on delivering public services and infrastructure to their citizens represents a whole new source of potential return on investment. Yet PPPs represent a major risk to developing countries. Not only do they create significant public financial obligations for the future without appearing in the official ‘debt’ figures for a government, they are also the most expensive way for governments to invest in public infrastructure and services. Ultimately PPPs cost much more than if the investment had been financed with direct government borrowing. This is because private sector borrowing costs more, private contractors demand a significant profit, and negotiations are normally weighted in the private sector’s favour. The debt payment obligations created by PPPs are not covered at all in World Bank and IMF Debt Sustainability Assessments, meaning that governments’ real future payment obligations are likely to be much higher than the already very worrying official figures which have prompted the launch of our No New Debt Trap campaign. PPPs were invented in the UK, where they were first introduced under the Conservative government of John Major in 1992. Known as the Private Finance Initiative (PFI), the scheme was expanded by the Blair government after 1997. From 1997-2007, PFI accounted for 88% of capital investment in new hospitals in the NHS. As a major economy, the UK should have a good chance of negotiations between government and the private sector leading to a good deal for the public, yet PFI has long been criticised for representing terrible value for money. A 2015 review by the UK National Audit Office found that investments through PFI schemes cost more than double they would if the government borrowed directly (typically 8% interest, compared to 4% for government borrowing). This doesn’t include the extra price for taxpayers of paying profits to private companies for the PPP projects. The true costs of PFI are now coming home to roost, particularly in the NHS. Cash-strapped NHS trusts are paying the private sector a record £2bn a year for fees for the construction and operation of hospitals under PFI, and several are facing bankruptcy because of these exorbitant costs. Over the lifetime of the PFI contracts, the public will end up paying up to 12 times the initial cost of the hospitals. The up-front cost of rebuilding Calderdale Royal Hospital in Yorkshire, for example, was £64.6m, but Calderdale and Huddersfield NHS Foundation Trust will end up paying a total of £773.2m. The reality of PPPs across the global South so far has reflected the UK’s experience. All too often, a government ends up paying over the odds to a private consortium to build a piece of infrastructure or provide a public service which it could have provided more cheaply by borrowing directly. The project ends up being delayed, sometimes severely, and eventually the user fees for the new service – water, electricity, healthcare – are so high that the poorest people can no longer afford them. The UK set up and funds the Private Infrastructure Development Group (PIDG), itself a PPP, which exists to promote Public-Private Partnerships to finance infrastructure in developing countries. Between 2002 and 2013 the UK’s Department for International Development disbursed $663 million from its aid budget to PIDG, covering two-thirds of the contributions by all donors. We took our warning to the Africa PPPs conference in London in November. In Lesotho, one of the first PFI hospitals in Africa is already costing three times more than the old public hospital it has replaced. As exposed by Oxfam and the Consumers Protection Association of Lesotho, the flagship Queen Mamohato Memorial Hospital, built by the private Tsepong consortium led by South African private healthcare company Netcare, is already eating up 51% of the Lesotho government’s total health budget. Lesotho is a low income country, and the government will also have to make spending cuts in other departments such as agriculture and education in order to cover the further projected 64% increase in its health budget over the next three years that’s needed to cover the PPP’s increasing costs. Meanwhile, shareholders in Tsepong are expecting an annual 25% return on their investment, which will mean they will have received 7.6 times their original investment at the end of the 18-year PPP contract, when the hospital will pass into government ownership. The project has been heavily supported by the World Bank’s International Finance Corporation (IFC). The IFC played a central role in the project design, including acting on behalf of the Lesotho government in the planning, tendering and contract negotiation, and receiving a $720,000 ‘success fee’ when the contract between the government and Tsepong was signed. In Tanzania, three PPPs have been implemented for power companies to supply electricity to the state-owned distributor Tanesco at a pre-determined price guaranteed by the government: one with Independent Power Tanzania Limited for a diesel-fuelled power plant in Dar es Salaam, and a second with Songas. When it started in 2004 Songas was majorityowned by the UK government through Globaleq, a fully owned subsidiary of the Department for International Development’s CDC Group. By 2007/08, the Tanzanian government audit office found that these two power companies were costing Tanesco 90% of its total revenue, and that it was “overburdened by the liabilities imposed by various power purchase agreements mostly entered without compliance with the requirements of the Public Procurement Act and its regulations”. A third electricity PPP was cancelled after a 2008 parliamentary inquiry found that the company involved had been granted favourable terms in the contract. However, the company that subsequently bought the contract, Dowans Holdings, then sued Tanesco through the International Chamber of Commerce, and Tanesco was ordered to pay $124 million. Tanesco increased energy tariffs for household consumers by 40% in 2009 to try to cover these costs, yet it continued to make a large loss. In 2013, the IMF estimated that government subsidies for electricity cost around 10% of government revenue. Much of this is used to pay the inflated costs in the power generation PPP agreements. In the early 2000s two major PPPs with foreign companies arose from the IMF and World Bank-sponsored ‘liberalisation’ of the Ugandan electricity sector: a 20-year concession to run the electricity distribution network, and a 30-year ‘Build, Operate and Transfer’ contract for a new hydro-electric plant at Bujagali Falls on the river Nile. Astonishingly, the ‘private’ company created to run Uganda’s electricity distribution sector, Umeme, was actually owned by the UK government. Umeme has been accused of defrauding the Ugandan government of hundreds of millions of dollars by overstating losses. The PPP has also resulted in massive increases in charges to domestic electricity consumers in Uganda, who are now burdened with a tariff of 18.5¢ for 2015, compared to an average in Sub-Saharan African countries of just 13¢. However, these tariff increases still aren’t sufficient to meet the payments guaranteed under the PPP deals, so the Ugandan government has to spend a further $100 million a year in subsidies. The Ugandan parliament has supported a recommendation to terminate the PPP concession with Umeme. The other PPP scheme, at Bujagali Falls, was initially abandoned when the main contractor became implicated in the Enron corruption scandal. It was then resurrected under a further PPP scheme funded partly through the European Investment Bank, and was completed in 2012. Spiralling costs have made it one of the most expensive large dam projects in the world, with prices for electricity produced some 80% higher than the globally accepted level for hydro-generation. An independent report has now called for nationalisation of the hydro-plant to bring an end to the damagingly high cost to Ugandan businesses and household consumers. The battle to stop PPPs intersects with many of the crucial campaigns in the UK today, from TTIP to tax justice. Governments trying to get out of bad PPP agreements can be sued by the companies involved through secretive investor-state courts like those being pushed through the proposed Transatlantic Trade and Investment Partnership (TTIP) between the US and EU, and other trade deals. What’s more, many of the companies set up to run PPPs are based in offshore tax havens, meaning that the profits made out of public services are not even contributing to their future running costs. Ending poverty means ensuring that everyone in the world has access to good quality essential public services. There is a mounting base of evidence and experience from all corners of the world that these aims are not compatible with delivering public services and infrastructure using PPPs. Public services should be funded through progressive taxation and cracking down on tax dodging by the wealthy and multinational companies, not by mortgaging them off at huge cost. Stopping the major debt risks posed by PPPs is a global challenge. 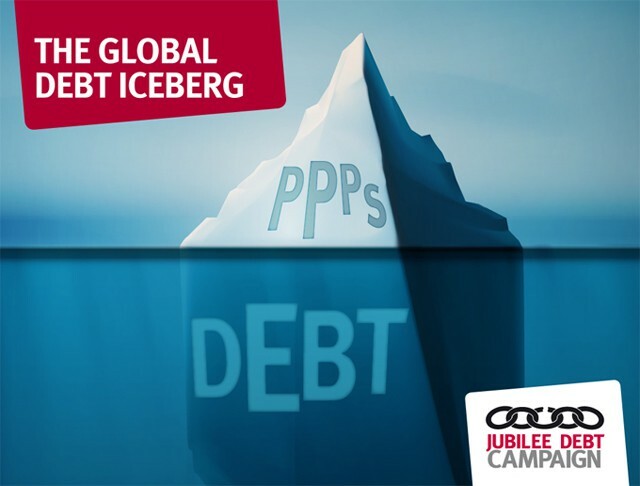 We need to tackle the PPP debt iceberg before it sinks developing country finances. The starting point has got to be the UK. 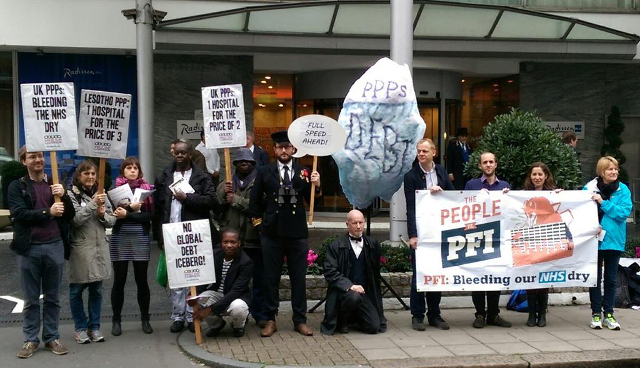 We need to expose the impact of PFI in the UK, and the role of rich countries like the UK in pushing this disastrous model on the global South.